Library Books Leap to Life | Kid Reporters' Notebook | Scholastic Inc. The Shreve Memorial Library recently held its first-ever Children’s Book Festival on the Shreveport campus of Louisiana State University. John Tuggle, the library’s executive director, said that festival organizers sought to “encourage young readers by bringing their favorite stories to life.” Indeed, such larger-than-life characters as Curious George, the Poky Little Puppy, and Winnie the Poo were available for photo opportunities. Attendees of the festival, which took place the weekend of May 5, had the chance to meet such authors as Alyssa Capucilli, who created the Biscuit series (HarperFestival); Brian Lies, who wrote and illustrated the Bats series (HMH Books for Young Readers); and Bob Shea, who wrote Unicorn Thinks He’s Pretty Great (Disney-Hyperion). Capucilli took questions from young readers. Many kids wanted advice on how to become a writer. “The best way to become a writer is to be a reader,” Capucilli said. “The more that you read, the more that your imagination grows.” Children enjoyed the opportunity to chat with her and have their books autographed. Author and illustrator Brian Lies shared the inspiration behind his series called Bats. 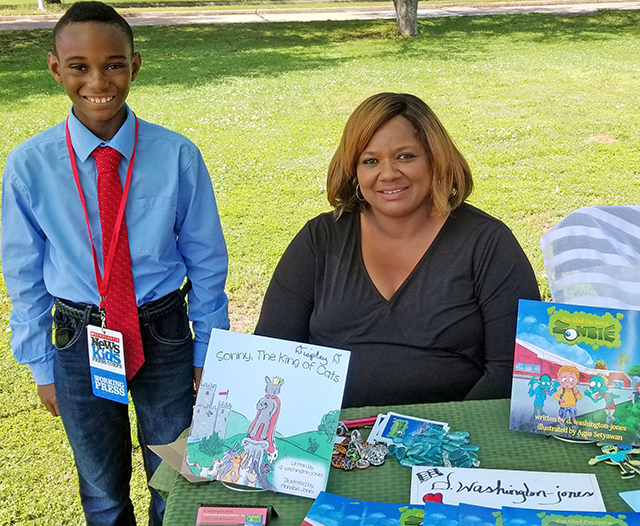 Local Shreveport author and illustrator Jasper Price unleashed the festival’s smelliest visitors: zombie socks from his book, Zombie Asockalypse. He was inspired to write the story, he said, after hearing about Ripley’s annual Rotten Sneaker Contest. An inflatable obstacle course, games, and the Shreveport mobile library truck kept kids entertained between author presentations. Reluctant and early readers were encouraged to read to therapy dogs, who were very eager to listen and cuddle. Families had the opportunity to obtain library cards and even get library books on site. The event was a great reminder of how much fun it can be to celebrate books.